Have you got dry eye? Dry Eye (Keratoconjunctivitis Sicca) is a very common condition which typically affects people as they get older. It is characterised by itchy, gritty eyes which may also be red. Many people describe their eyes as feeling hot or 'burning.' Warm, dry environments and air conditioned buildings can often make the symptoms worse. Confusingly one of the symptoms of a dry eye is is that the may eyes water excessively, especially outdoors and in the wind. This overproduction of tears occurs as the surface of the eye (the cornea) is irritated by the eyelid during blinking due to insufficient lubrication, and poor quality tears. The tear film is made up of three layers. A watery (aqueous) layer, a mucosy layer and a lipid layer. 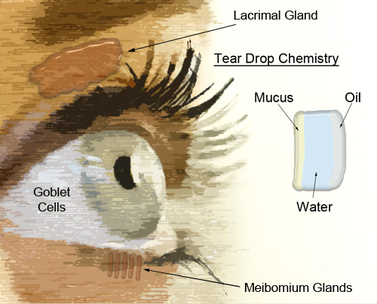 The aqueous layer is produced by the lacrimal gland just under the eyebrow and the mucosy layer produced by the goblet cells on the surface of the eye. If damaged these glands are very difficult to treat and as a result affect the quality of the tear production. The lipid layer is produced by the meibomium glands. These glands are located on the upper and lower lid margins adjacent to the eyelashes. The glands can easily become partially or totally blocked due to the lipid solidifying within them. The lipid layer is important as it reduces evaporation of the tears from the surface of the eye, helping to reduce dry eye symptoms. Simple eyelid hygiene can dramatically improve the symptoms of dry eye helping to unblock the glands and improve the tear layer quality. 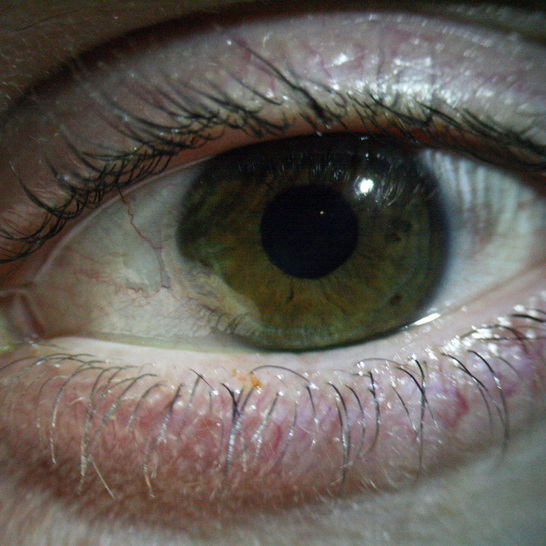 (More information about eyelid hygiene can be found in the "Blepahaitis" section). If this does not alleviate the symptoms fully then artificial tears may be used. These generally come in 3 forms, ointments, gels and drops. Ointments are the most effective due to their viscosity giving maximum lubrication, however they do have a tendency to temporarily blur the vision. Drops are the easiest to administer but offer only very temporary relief requiring more frequent instillation. The gel preparations are a good compromise between maximum relief and minimum blurring. It is really important to remember that artificial tears do not treat the dry eye, they merely alleviate the symptoms temporarily. Artificial tears need to be used regularly to make an impact and once the symptoms become less bothersome if you cease use of the artificial tears your dry eye symptoms will return eventually if not straight away. It is vital that a maintenance dose is administered. For instance if you use the drops six times daily whilst suffering the symptoms of dry eye and they eventually get better, you should then gradually reduce the frequency of the drops until you begin to feel the recurrence. You will then know the minimum amount of drops needed to keep your dry eye at bay. It is always better to treat the underlying problem and in most cases this is meibomium gland dysfunction (see above). Eyelid hygiene is essential and it is quite useful to use a warm compress such as a hot flannel, or better still an eyebag (microwavable wheat sac) on the eyes to open up the pores and melt the solidified lipid. This will hopefully improve the tear production and help with lubrication.